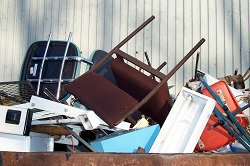 If you have unwanted furniture in your home or office, then you know the problems it can bring. The can take up space, will need to be cleaned and moved every now again, can ruin the atmosphere, feel and look of a room etc. Getting rid of such goods though can be a lot of work, as you have to shift and dispose of them in specific manners. 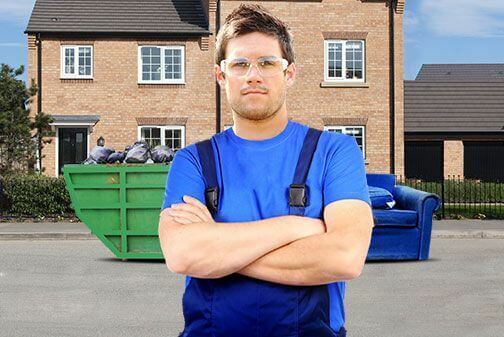 If you want your furniture disposal in London to be simple and swift, then call us on 020 3795 9581 today. We at London Waste Removal are an expert furniture removal firm that can handle this job for you. We can collect your goods safely from your address and take things away to be disposed, so that you don't need to do a thing. Our team will handle the job quickly, getting rid of all your old furniture in no time. They will converse with you to work out what you want removed, the best route and method to take and so on. They may break up some objects to make them easier to move and will do this correctly. They will shift the furniture though your home without any trouble, so there will be no damages or injuries. 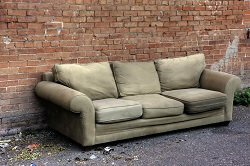 We aim to give you the greenest sofa disposal service in London. We want to recycle as many of the goods we collect as possible. We do this so that things aren't dumped into landfills and so that resources aren't wasted in making new items. Our furniture disposal team will collect your goods and take them to a recycling centre. We work with local businesses and organisations to get this done properly and safely. We follow all guidelines and laws, so all of this will be done correctly. We don't charge anything for recycling and you don't need to do any extra work, so you pay nothing extra for recycling. We will give you the best value sofa clearance solutions in the area. We do this by providing a no obligation required quote. This estimate costs you nothing and assures you of the best price. To get your quote, call 020 3795 9581 now and we will arrange the furniture clearance services you need. You choose what you need from us, so you get a customised service. Select how you want us to help with your old furniture collection and we will charge you accordingly. The quote will showcase this and so you will see the price in advance. If you do not like the deal, you can pass on the quote and request a new one, working on it until you are assured of the best experience, price and result. If you want the best furniture disposal solution in London, call us today. We will provide every bit of support you need for this task. We will send as many staff members as you need, whenever you require, wherever you require and as often as you like. We are always available to collect your old furniture, no matter what type or size. We will get the job done quickly and safely, so your unwanted furniture will be gone before you know it. For more info, call London Waste Removal today on 020 3795 9581.